During Memorial Day weekend, we went up to Preston, Idaho with the Olsen clan. 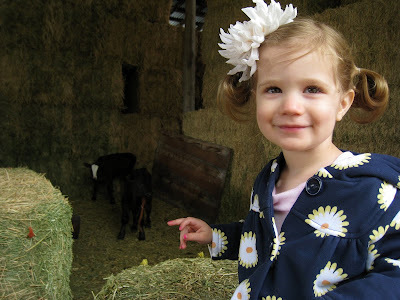 While there, we went to visit the Becksteads (Krista's maternal grandparents) on their farm. 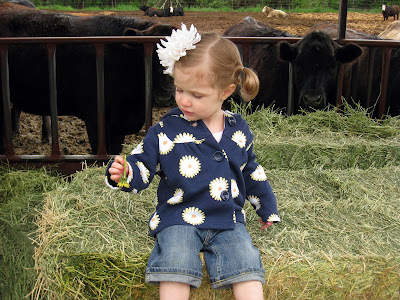 Ava was pretty excited to see the farm again, but things started out on the wrong foot when her dandelion fell over. 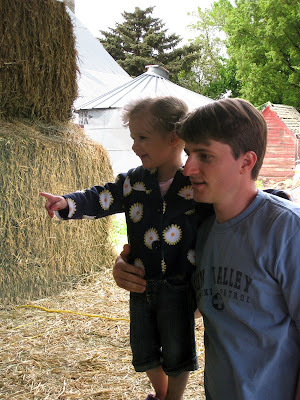 Larry soon distracted her, however, by pointing out some of the farm animals and making cow noises. What is Ava so excitedly pointing at here you ask...? ...why Grandpa Beckstead's cows of course. 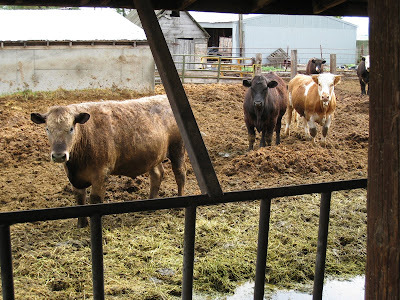 Although the cows do not appear to be equally enthused. Ava especially liked these little calves. 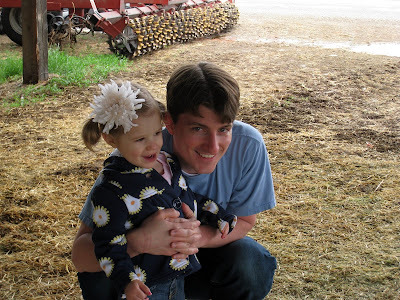 Not pictured: Ava fretting over her shoes getting dirty from walking around the barnyard (she's definitely her father's daughter). Have you ever heard the kiddie song "down on grandpa's farm"? Well I think Ava would like it since her (great) grandpa really does have a farm. I take Ava to story time at the library down our street and they actually sing that song a lot and it is one of Ava's favorites. She always wants to hold up the puppy pictures! What fun pics! I love the giant flower in her hair too...she always looks so cute! she was so funny about her shoes getting mud on them. Now you need to do a post of her swimming in the tiny pool up there. It is always so fun to spend time with you guys in Idaho-Ava is so hilarious and you guys are tons of fun of course!